Demonstrating her exquisitely gifted voice and Highlighting her stupendous vocal attributes, range and technical precision. 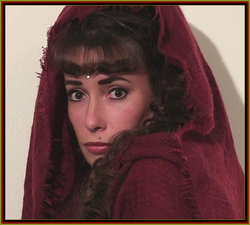 The Prelude CD embodies what it means to sing as a True Coloratura Soprano. Ms Aguinaga astounds listeners with operatic feats only the top opera voices in the world dare attempt. The fame and spender of these cherished coloratura classics are once again revived right out of history and performed with the passion and artistic emotion that only Idara Aguinaga can deliver and the original composers could only of first hoped for. Buy her fabulous CD Here. 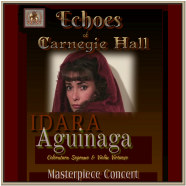 Ms. Idara Aguinaga -Dramatic Bel Canto Coloratura Soprano & Violin Virtuoso Extraordinaire just released her newest (67min / 12 track) CD "Echoes of Carnegie Hall." Recorded live at the Glacier Performance Hall in Kalispell, MT. Idara Aguinaga - sharing another one of her many gifts... this time as a conductor directing The Valley Voices Choir with the FVCC Orchestra at the October 23rd fundraiser concert "Montana to Carnegie Hall". March 22 : Classical Performance - 7pm at Holy Rosary Cathedral in Bozeman, MT. - Email for more Info. December 19th﻿ : Free Christmas Concert Recital - St. John Paul II in Bigfork, MT. ﻿﻿November 13th﻿﻿ ﻿﻿:﻿﻿ Private Event - Kalispell Chamber of Commerce – 110th Annual Banquet in Kalispell, MT. October 10﻿﻿th﻿﻿ : Concert Recital - St Mathews Church in Kalispell, Montana - ﻿Email﻿﻿ for more Info﻿. Fundraiser concert "Montana to Carnegie Hall". Idara Aguinaga - Conductor/ Composer directs the first ever FVCC Student Orchestra Friday April 22 @7pm. The performance was held in the Community Hall in the A/T Bldg. Donations supported the college's developing music program. Along with Schubert's Military March and Tchaikovsky's Theme from Concerto No.1 Op 23, Ms Aguinaga (composer/conductor) directed these first semester students in the performance of her own original orchestral composition Underforstatt Makt. Aguinaga's composition stirred high regard and respect to her skill as a composer and conductor at this special classical music event. Commercial Free Classical UnMuted will be an hour long radio program presenting the Classical genre to both global and local audiences for your listening enjoyment. In her first 2 years singing as a coloratura soprano, Idara Aguinaga nails over 40 highly technical operatic pieces in live performances... stunning the music world. Ms Aguinaga (adjunct professor) conducts the first ever FVCC Student Orchestra in the history of the college. Her hope is to help build a full-time orchestral program for the college. Ms Idara Aguinaga performs virtuosic violin playing while simultaneously singing operatically. "... an historic feat" says J Greg Ontiveros of K.C.I. Echoes of Carnegie Hall: "an accomplished violinist and gifted coloratura soprano... Her vocal range is stunning "
Ms Idara Aguinaga was selected by Kinnor Classics Intl.﻿ for category Artist: "Dramatic BelCanto Coloratura Soprano" and will be exclusively represented by KCI for the 2014-15 season. She will remain under KCI's management into the foreseeable future as we fully develop her promotional and performance schedules going forward. Kinnor (Hebrew: כִּנּוֹר‎) is an ancient Israelite musical instrument. The kinnor is the first string instrument to be mentioned in the Bible, appearing in Genesis 4:21 and was typically played with a plectrum (pick), though the Book of Samuel in the Bible notes that David played the kinoor "with his hand. It has been referred to as the "national instrument" of the Jewish people. The word kinnor is used in modern Hebrew to signify the modern Western violin.